These L.A.-based DJs are so cool that you’ve probably never even heard of them. Los Angeles has a live music scene that can be sampled everywhere from hole-in-the-wall bars to the Hollywood Bowl, yet so often we fall short when it comes to local radio stations that play music on par with our live scene. Enter Dublab Soundsystem, the L.A.-based DJ collective that has spent the last 14 years building an Internet radio empire, amassing a roster of intriguing musicians who broadcast worldwide. In our June Summer Guide, Dublab curated the ultimate summertime playlist inspired by their favorite L.A. hangouts. Here, we ask Dublabites Mark “Frosty” McNeill, Jake Viator, and Ale Cohen to tell us more about their musical inspiration, the Dublab operation, and how you can listen to their station. How did Dublab Soundsystem get underway? Mark “Frosty” McNeill: I was running the student radio station at USC, and we had a really great staff of DJs. We decided to continue what we had started outside of a school context. Internet radio was in its early state but it seemed like a viable way to share music with the world. Ale Cohen: [Internet radio] was a vacant, new territory. No one knew what it was going to become, but everyone knew it was going to be something new, something under different rules. What Internet platform were you using at the time? MM: Real Media, so we were streaming though Real Audio. Most of our listeners were probably using dial-up, 56k modems, or early DSL, kind of like listening at the end of a tin can. Jake Viator: I was a fan back then, and it didn’t seem low-tech. It seemed very high-tech. What music were you playing at the time? MM: We were focused on these microgenre musical forms that weren’t really getting airplay. At that point it was underground house music, 60s psychedelic music. We coined the genre “Future Roots,” which is the idea of playing the newest, freshest music straight out of the studio but connecting it to the lineage of the music that inspired its creation. In the same set you might hear a song that’s not going to be released for two years, but you’ll also zoom back to the earliest moments of recorded music history and hear something from the turn of the 20th century. We’ve never told a DJ what they can and cannot play, so it’s more about finding people who have wide, progressive outlooks on music, and letting them do what they do best. Did you ever think that you’d have so many fans in other countries? When was the first time that you thought, ‘Whoa—someone in Spain is listening to us’? MM: Pretty immediately. We had a video broadfeed and a chatroom, so we connected with listeners from all over the world. There weren’t as many people from Brazil or Africa—certain places that didn’t have as much connectivity—but over the years we’ve seen the Internet access build. Do all of your DJs appreciate your hands-off approach with their music? AC: People come here with the idea that they can try new things. For example, Money Mark, who plays with the Beastie Boys, was on his way to play one of our pledge drives. He bought a keyboard on the way here, went into the bathroom, ran a cable out, and did a performance from the bathroom on the keyboard that he bought. What sets Dublab apart from other radio? JV: Radio is one of the most rigid institutions left in the music world. It’s very sponsor-driven. Things have to be played at a certain time, it’s controlled by the government, you have to say your station name at the top of every hour. It’s very structured. I think that’s the big element missing from Dublab: structure. So you don’t have sponsors breathing down your neck? MM: We have sponsors, but the sponsors we attract want to reach an audience that has a wide taste in nature and food and films and all these things. JV: It helps that we’re non-profit, too. There’s a certain expectation of what we’ll do for a sponsor. We’re so dedicated to our listeners; they support us and we only want to give them stuff that would interest or enlighten them. AC: We do two pledge drives just like public radio. We get underwriters and some grants from the L.A. County Arts Commission and the Los Angeles Department of Cultural Affairs, so structure is set in place and we follow that. When we have our pledge drive, what we call a Proton Drive, we do it for three weeks in spring and then another three weeks in fall. Of course you can get a big donation of $300, which is good. But even when people donate a dollar, two, three—they’re broke, but they’re like, here’s the little that I have. Those get us just as excited because it’s a sign that they really enjoy it. Who would you say is the bulk of your audience? What’s the age range? How many people do you reach? AC: We do a lot of events that are open to the public and we see young listeners that show up because it’s free, but the bulk of our listenership falls between early 20s to mid thirties. We get emails from people who are in their 60s as well. JV: To me the most impressive stat is that half of the audience is from the U.S. and the other half is from all over the place. There are little patches all over the world. It’s such a global community that it freaks me out sometimes. Where is the most obscure place that you have reached? MM: We have someone who listens from a very remote Russian province called Arkhangelsk. We even have listeners in war zones. One of our listeners, Jackson Allers, is a journalist for Al Jazeera in Beirut. He says he comes home and listens to Dublab at night because he can connect to something positive. We’ve had people say, “You’ve helped me through some of the hardest times of my life.” Those things motivate us. What’s the coolest part about running an online radio station? MM: I think it’s that we’re able to open their eyes to this whole world of music that is made by people who are doing it for the love of it. And through Dublab they can explore and find all these tangents. There are people who have launched record labels because they’ve been listeners, started making music. Those are great benefits to us to inspire people. What are all of the different places people can hear Dublab? MM: They can listen at Dublab.com, but we also have three different podcast channels that are on the iTunes directory and lots of other podcast directories. On Dublab.com, you’ll find two streams: The Dubstream, which is the main one that we broadcast live from, and then our Theme-Stream, which we put together using themed music. JV: The newest, most exciting thing is that we have an iPhone app, which you can find in the iTunes store. And a Droid app on the way. What is a typical day in the life for you guys? MM: We’re here broadcasting live Tuesday through Friday at the very least. And usually we broadcast from 10 a.m. to 4 p.m. or 6 p.m. We also do remote broadcasts—from Scoops Ice Cream Shop, from galleries. We end up DJing a lot of events, too: exhibitions at the Getty center, the Abbot Kinney Festival main stage, the Eagle Rock Festival main stage, Levitt Pavilion, and all sorts of different music happenings. We’ve done a big takeover of LACMA a couple of years in a row. We also have several signature events that we do, one of which is called Tonalism. It’s an all night music event that usually goes from 6 p.m. to 6 a.m.
AC: People pack the place and we encourage them to bring pillows or cushions and enjoy music while lying down. It’s an event inspired by the New York and Los Angeles experimental music happenings back in the day, like in Griffith Park or in the lofts of New York in the ’50s and ’60s. MM: People can go to dublab.com/events to see what we’ve got going on. Do you ever solicit music from unknown DJs? MM: We have an open submission policy. I think more than anything we give young people whose music we really dig an opportunity to perform live. We feature them on our MP3 blogger and our video blog. AC: It happens very often. Teen Girl Fantasy is an example of someone who was very young when they played here. JV: If you look at the dates on our sessions and then you look at the people who’ve become successful, typically their Dublab sessions are very early on in their careers. Animal Collective live at Dublab in ‘99, Atlas Sound live at Dublab in 2000. Shlomo was an intern here, Teen Girl Fantasy was an intern here. 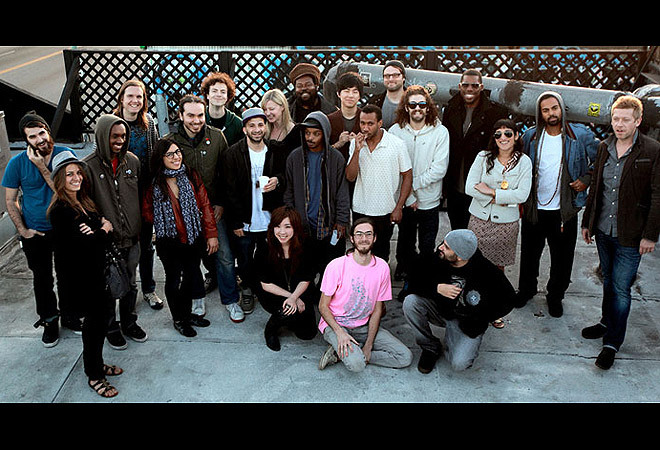 Flying Lotus was hanging around the office in 2004; we met Teebs on MySpace. I feel like Dublab is kind of that ego-less place that is collaborative, creative, and feels like a safe house to young artists. They can make a wrong move and it’s ok.